Creamy, cool and just a little bit chocolatey. 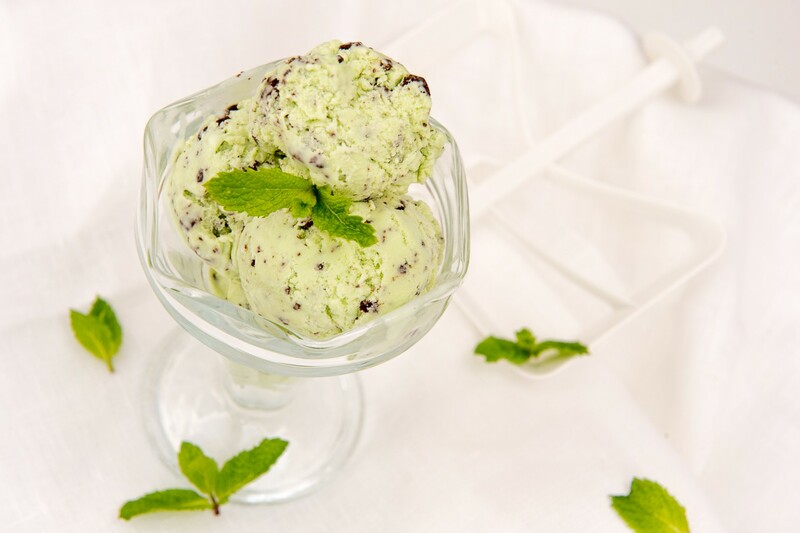 This mint chocolate-chip ice cream succeeds at being both refreshing and indulgent at once. The ultimate treat on a hot summer’s day! It’s perfect just as it is, scooped into a cone, or served with a rich chocolate sauce for an extra chocolate hit. 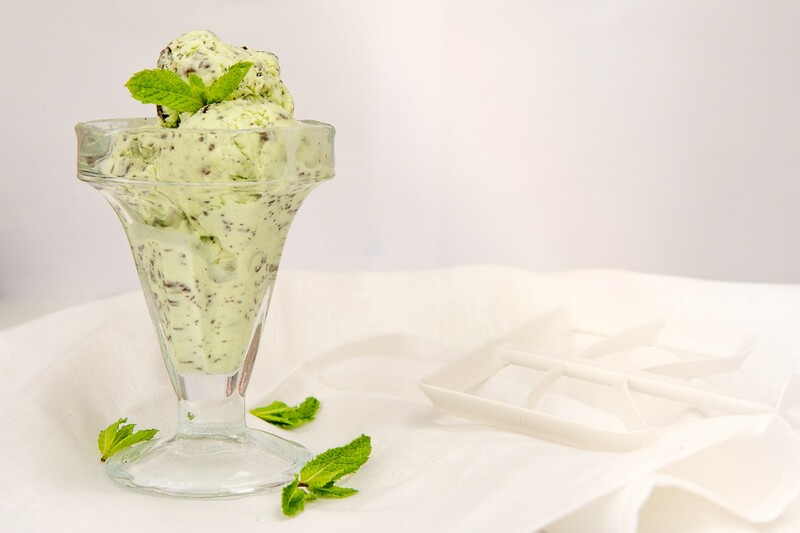 The key to the perfect mint ice-cream is subtlety. This refers to both the flavour and the colour. You need only a drop or two of colouring to achieve a beautiful, mild mint-green hue. And go easy on the peppermint flavour too. Heavy-handedness will result in a mouth-numbing and bitter taste. 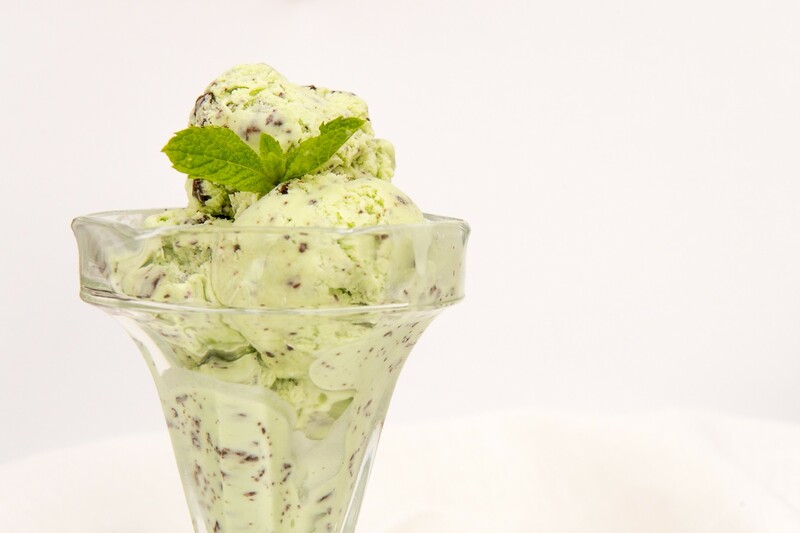 An ice-cream maker is required to achieved a silky smooth texture. Add the milk and cream to a saucepan with half of the sugar and a pinch of salt, and heat over medium heat until just starting to boil. Remove from the heat. In the meantime, whisk together the egg yolks and remaining sugar until pale and creamy. Carefully pour the hot cream mixture into the egg yolk mixture in a thin stream, whisking constantly to avoid curdling. Strain this mixture back into the saucepan and heat over medium heat, stirring constantly, until thickened. The mixture should coat the back of a spoon and have a custard-like consistency. Remove from the heat and allow to cool for a few minutes. Add in the food colouring, a drop at a time, until you have a lovely mint green. Cover the mixture with clingfilm, pushing the clingfilm right onto the surface of the custard so that it doesn’t develop a skin. Allow to cool to room temperature, then refrigerate overnight. Churn the mixture in an ice-cream maker as per the manufacturer’s instructions. When the mixture is almost completely churned, add in the chopped chocolate (being careful not to add in any chocolate dust as it will give the ice cream a brownish colour). Transfer to a container and freeze until solid, about 3 hours. * I used Peppermint Essence from Woolworths and needed 2 teaspoons. As flavour strengths vary, I recommend you start with a few drops and keep tasting until you get a mild minty flavour. If you over-flavour the ice-cream, it will become bitter.